Laminate flooring with pad has quite a few advantages. First of all, it saves your time because you don`t have to search for suitable underlayment for you subfloor. There are many different underlays on market today so it can take you quite a lot time to find the right one for your floors. Padded laminate flooring also saves time because you don`t have to separately install underlayment which is a process that demands precise and detailed work. Underlayment has to be laid correctly without any tears and it has to be fixated. After that step is finished you can start to install laminate flooring. When installing laminate flooring with attached underlayment, you can concentrate on seams and finished overall appearance of your new floor. There is almost no chance that padding would tear during installation. Tiles with pad are easier to install then tiles without pad. You can additionally install vapour barrier under tiles with pad. Vapour barrier insures extra protection to laminate with pad and it keeps it warmer because cold air can reach tiles so easily. We have many kinds of laminate flooring with pad. You can choose from different colours, decors, surface textures. Important thing for laminate flooring with pad is also thickness. Thicker laminate offers better stability and surface warmth. 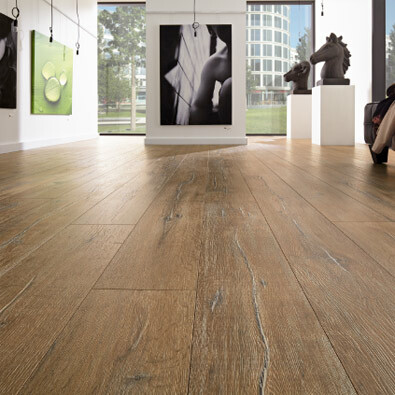 Durability does not always depend on thickness of laminate flooring with attached underlayment. Sometimes thinner laminate flooring with attached underlayment has better durability, reason for that is the top layer. Durability depends on material used for top layer and the thickness of it. You can also choose sizes of laminate tiles with padding. We recommend use of smaller tiles for smaller rooms and use of bigger tiles for vast rooms. You can combine different sizes of tiles and create beautiful patterns. All laminate flooring with attached underlayment has click installation system which is not complicated. Underlayment is very important because it works as a sound, water and temperature barrier. That is way installation of padding for laminate flooring has to be done perfectly. Under padding for laminate flooring also gives tiles stability and allows natural contraction. If subfloor has minor imperfections, underlayment will correct it. If imperfections in subfloor are big, it is best to correct them and install underlayment after that. If pad for laminate flooring is not used, walking on laminate can be quite loud and it can be annoying for neighbour bellow you.